Here's what you need to know about Mrs. Who, Mindy Kaling's character from "A Wrinkle in Time"
After over five decades as a beloved book, A Wrinkle in Time is officially on its way to the big screen. Directed by Ava DuVernay, the long-awaited adaptation of Madeleine L’Engle’s novel appears to be everything we’ve been waiting for. While the new A Wrinkle in Time features a few much-needed updates, including a diverse cast of all-stars, the story is largely the one we all know and love. The film follows Meg Murry, her younger brother Charles Wallace, and her new friend Calvin O’Keefe on a journey across the fifth dimension through time and space to save her captured father from an unknown evil force. But the blockbuster doesn’t just boast a big name behind the camera; A Wrinkle in Time is full of some of the biggest stars in Hollywood, including Reese Witherspoon, Mindy Kaling, Oprah Winfrey, Chris Pine, Gugu Mbatha-Raw, Zach Galifianakis, and newcomer Storm Reid. So yeah, it’s safe to say, this film is a PRETTY BIG DEAL. But while the casting itself couldn’t be more spectacular, if there’s one thing more highly anticipated than the final cut of the film itself, it’s the appearances from Witherspoon, Kaling, and Winfrey, who play the three most iconic characters from the novel. The trio star as Mrs. Whatsit, Mrs. Who, and Mrs. Which, the celestial beings who guide Meg and company on their dangerous journey through time and space. While they’re best known as a trio, each of the beings possesses their own set of unique traits and characteristics that makes them instrumental to Meg, Calvin, and Charles. Mrs. Who is the most enigmatic of the three. Age-wise, she falls between the oldest and most powerful Mrs. Which and the younger and seemingly naïve Mrs. Whatsit. While unlike Mrs. Which, Mrs. Who can materialize as a corporeal being, but she finds it difficult to put ideas and thoughts into words; the most worldly of the trio, in the novel, Mrs. Who uses quotes from figures ranging from Dante and Euripides to Shakespeare and Cervantes to assist in expressing her thoughts. While she’s the figure readers spent the least amount of time getting to know — although her quotes definitely allowed us to feel well read growing up — her contributions were just as important, albeit a little bit more challenging to decipher. But in between her many, many quotes, Mrs. Who is the one who ultimately gives Meg the key to reuniting with her father. In the film, the inimitable, witty Mindy Kaling takes on the role of Mrs. Who. DuVernay revealed that when casting her three Mrs. W’s, she had a very specific look in mind — and added that Mindy was the first person she thought of for the role. "I wanted a black Mrs., a white Mrs., and a Mrs. that was not either, and Mindy was the first one that came to mind. I feel like we don’t talk about a lot of the other colors and cultures enough, and Mindy is so beautiful to me," DuVernay told Entertainment Weekly. "Her character is one that, in her costumes and in working with Mindy, we wanted to bring in a remix of styles and cultures and customs from around the world. She was a real partner in that. She was working with two legends, but I think she’s a legend in the making in terms of what she does and being a fresh voice as a comedic actress." We definitely agree that Kaling deserves all the recognition in the world for being so incredible in front of and behind the camera, and we think her status as an understated powerhouse makes her even more perfect to take on Mrs. Who. 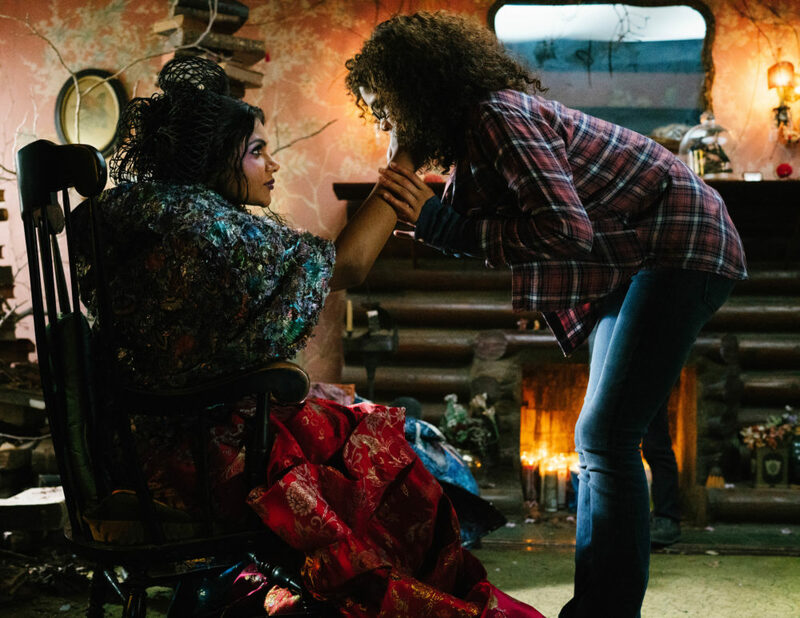 We can’t wait to see Mindy dropping quotes left and right as Mrs. Who when A Wrinkle in Time lands in theaters on March 9th!